“A Loving Home for Every Child” – Motto written on a sign at the entrance of a SOS Children’s Village in Ethiopia. A SOS Mother with one of her daughters. One of the most heartwarming afternoons during my two-week trip to Ethiopia as a fellow for the International Reporting Project was spent visiting a SOS Children’s Village. SOS Children is an independent, non-governmental international development organization that provides loving homes for abandoned and orphaned children in 133 countries for almost 82,100 children. It was founded in 1949 by Austrian Hermann Gmeiner with the first SOS Children’s Village built in Imst, Austria as a home for children orphaned by World War II. Today, SOS Children works to provide abandoned, destitute and orphaned children with a loving, family based home. Every child in a SOS Village belongs to a family and is provided with a SOS Mother and “siblings” who are the other SOS Children living under the same roof. This allows the children to grow up in a family being loved and feeling secure. Within each village, there are up to fifteen families living together in a community and each family has up to ten children per house. It is a wonderful model and has had a huge impact on the children’s lives and futures. SOS Children started working in Ethiopia in 1974 with the opening of the first village in Mekelle and over the years it has added six other villages caring for 1,645 children in SOS families. SOS Children’s education and training program unit has also benefited over 3,400 children and youth as well as children coming from the neighboring communities who are in need of services. 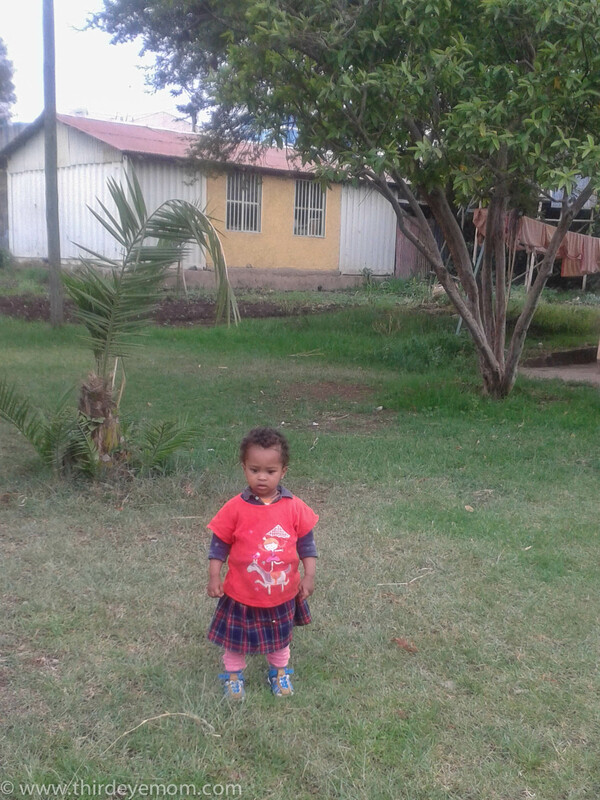 A child watches me curiously within one of SOS Ethiopia’s villages. Our group arrived at one of Ethiopia’s seven SOS Villages to spend an afternoon learning about the program and how it is changing lives. As we entered the village, I was struck by the beauty and peacefulness of the place. Unlike many parts of Ethiopia, the SOS Village is well maintained with lovely green lawns, beautiful flowers and gardens abound. 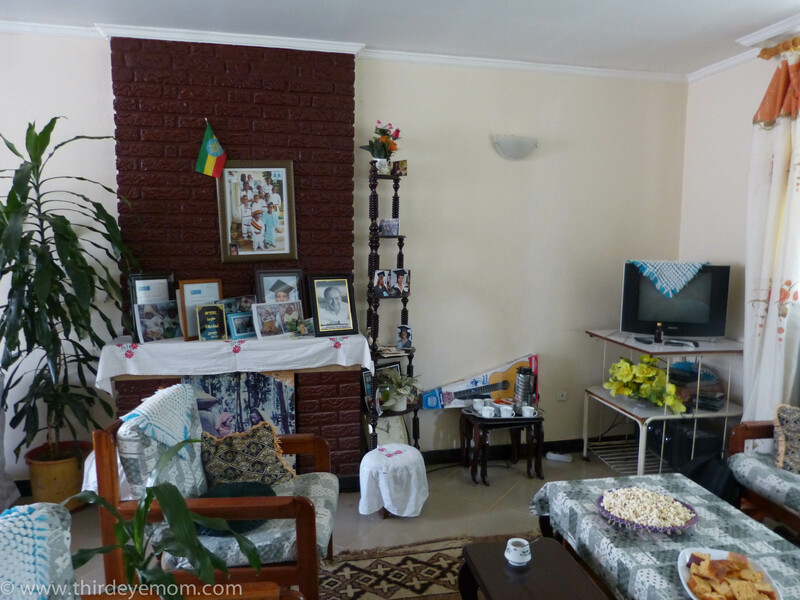 There are 15 nicely built homes all with electricity, running water and vegetable gardens scattered throughout the village and a four-room preschool and kindergarten right in the heart of the compound. We were greeted at the gate by two beautiful children dressed in white and each of us were given a white, long-stemmed rose. I desperately wanted to grab my camera as I was so moved by their loveliness but since these children are orphans, we were advised to be careful with our cameras and only take photos with permission. Furthermore, In order to protect the privacy of the children, all names in this post have been changed. The preschool and kindergarten is right inside the village. The entrance to SOS Children. Laundry drying is a common sight within the village. We first received an overview of SOS Children by the director of the village, and then went on two home visits to meet SOS families. Our first visit was with Genet and her family. Genet is the mother of ten children, 8 boys and 2 girls. The youngest is a baby boy aged 2 who entered the family at six months old and the oldest child is 13 years old. Genet decided to become a SOS mom after raising her own two daughters who are now in their early twenties. As a SOS mother, she lives in the house and cares for the children six days a week and has Sunday free to herself while another helper called an “Aunt” watches after the children. Genet was inspired to join SOS due to her love and passion for raising children. 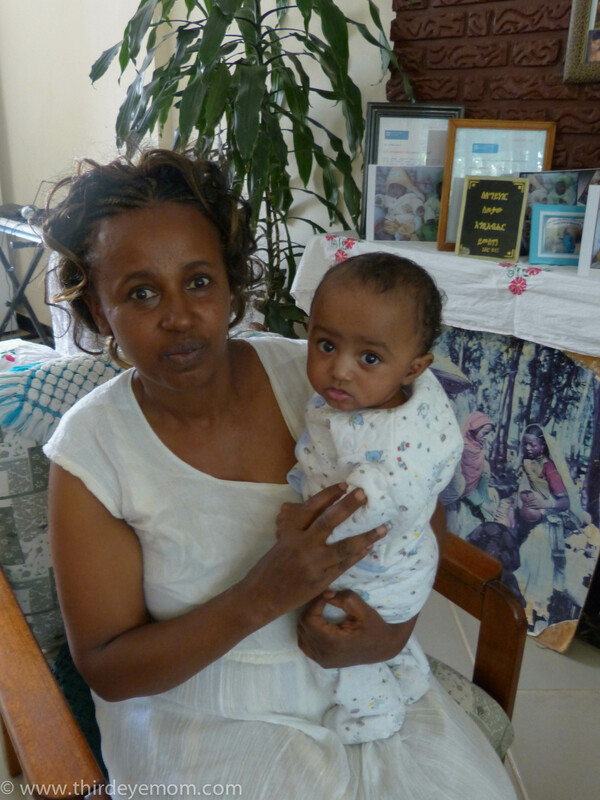 Like all SOS mothers, she underwent a stringent application process and 3-4 months of training at the national office in Addis. 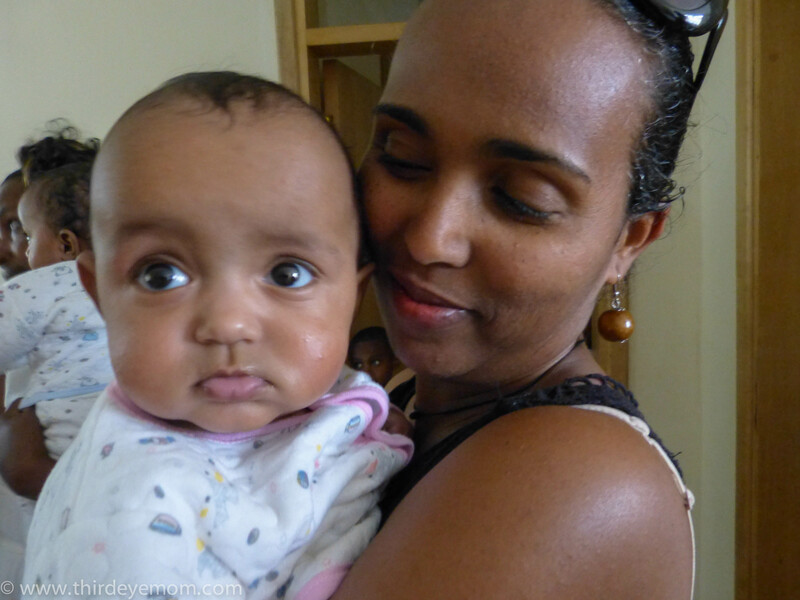 After two years of evaluation and training, she became a full-time SOS mother at the village. It is evident in Genet’s eyes and gentle manner that she is a wonderful, loving mother. 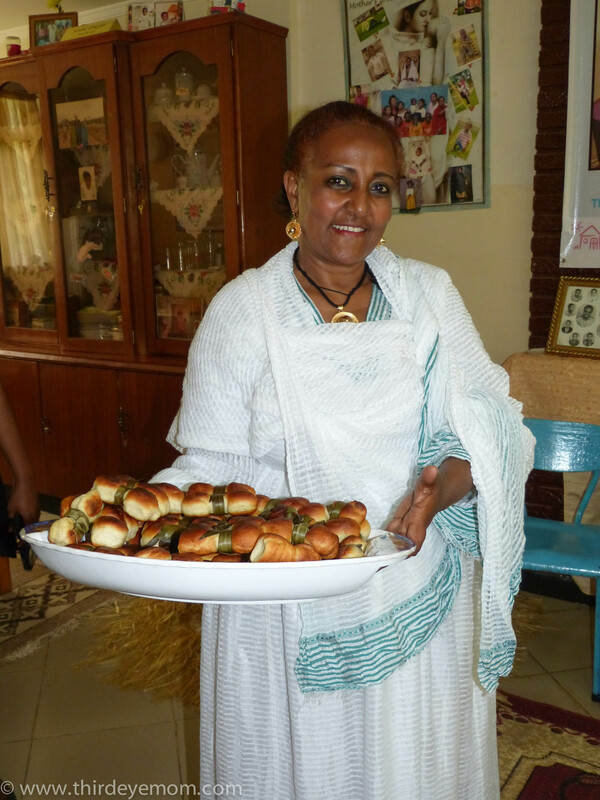 Genet welcomes us with rolls and traditional Ethiopian coffee into her home. Genet’s home is a warm and loving place. There are three bedrooms with bunks for the older children and the youngest child has his own room. 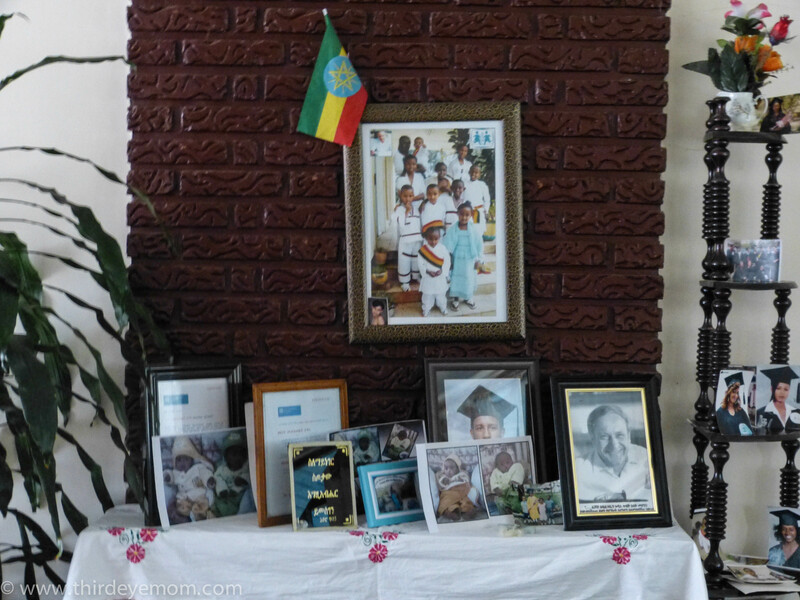 The shrine of photos documenting the success of children who have lived and grown up in Genet’s home. Per Genet, the hardest thing about being a SOS mom is raising kids that come from such difficult, traumatic backgrounds. Many of the children come into her home feeling angry, sad or upset but thankfully SOS has social workers on site who help the children through their struggles. 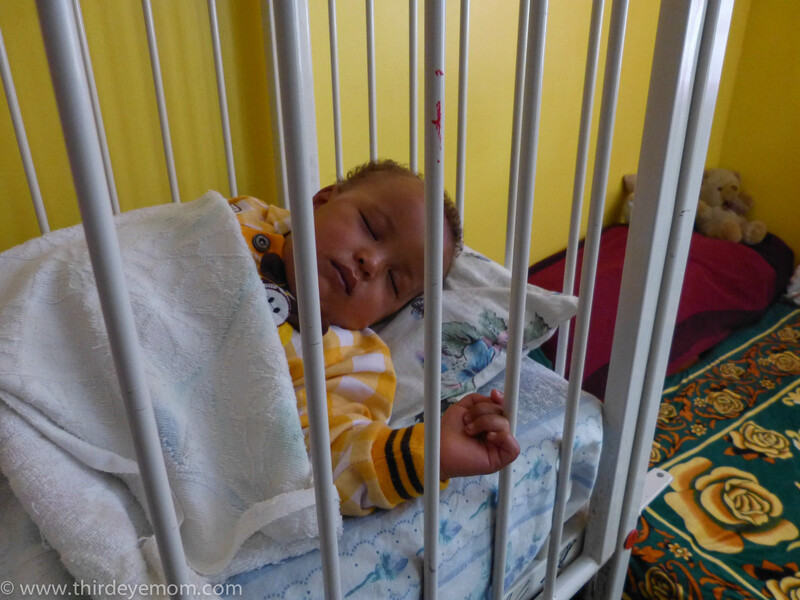 Genet’s two-year-old son sleeps peacefully while we look in. 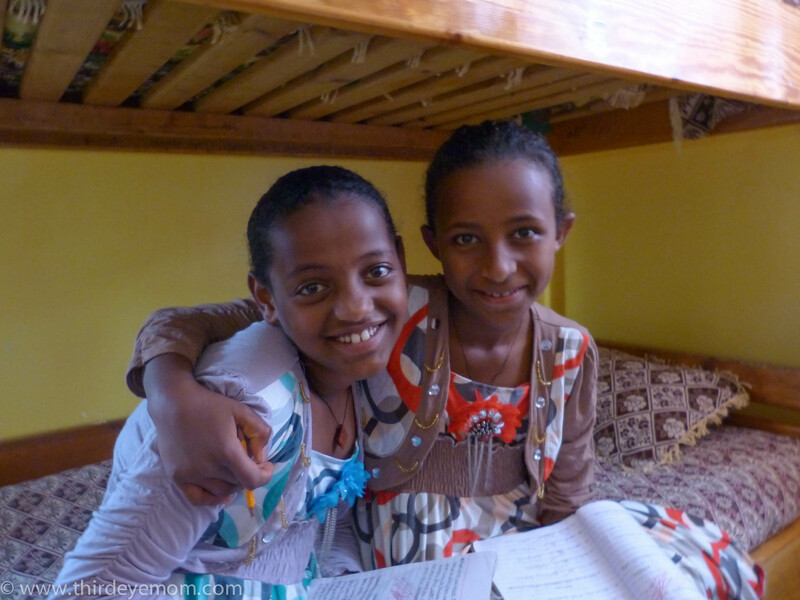 Genet’s two daughters doing their homework after school. 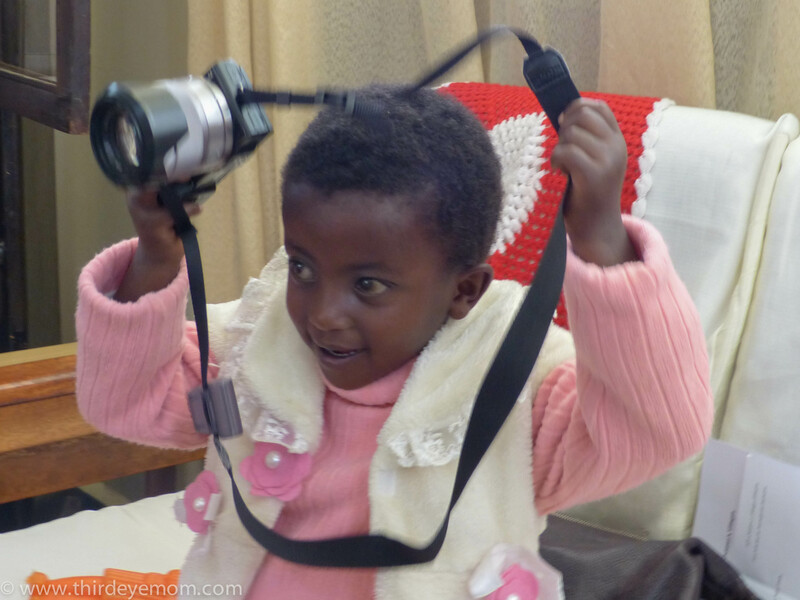 Genet’s five-year old daughter stole the show during our meeting and had to try all our equipment. She loved the camera and also enjoyed the recording equipment. SOS Children welcomes kids up to age six unless they have a younger sibling. They are matched with a SOS mother and family and will live in the village until they finish school. What is so wonderful about the program is that SOS Children also provides assistance with going to technical school and university. The goal is to have the children self-reliant after they graduate from college or vocational training. So far, over 92% of the children are which demonstrates the success of the SOS Model. Genet prepares traditional Ethiopian coffee for us in her home. Pouring the delicious dark brew into cups. Our next visit was to Mihirat’s home. Mihirat is the mother of ten children, 4 girls and six boys, including a set of twin babies, and she has been a SOS mother for nine years. She has raised 16 children since she has been with SOS and it is hard to believe that she is fifty years old given her youthful manner. Mihirat with her twins. She has extra help during the night to help care for the twins (age 7 months) and her 8 children. Beautiful Mihirat with one of the twins at her home. A social worker holding the girl twin at Mihirat’s home. 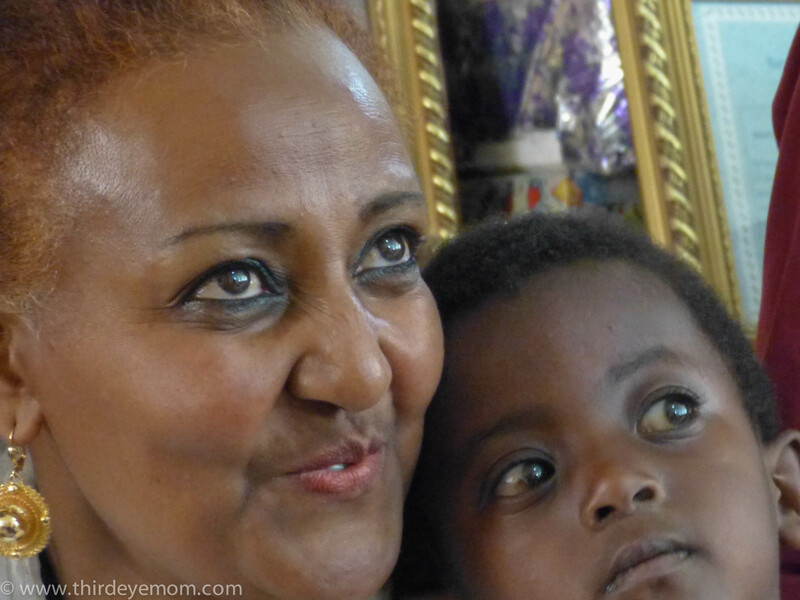 Mihirat’s favorite thing about being a SOS mother is the love and fulfillment she has in raising the children. As a mother of over 16 children at SOS she has seen several graduate and go on to live a fulfilling life which has made her feel blessed. Mihirat’s house rules are that everyone must show love and respect. SOS Children’s villages have a preschool and kindergarten within the village and the older children go to the local community schools nearby. They also have nurses on site to help care for the children and offer educational services to children in need throughout the community as well. Children inside the SOS Children’s village school. As we left SOS Children late in the day, the sun had reappeared after the habitual afternoon rains. Children were everywhere, playing hide and seek, ball and running around the grounds. It was a happy place, and I smiled realizing what a wonderful opportunity SOS Children has given these children for a brighter day. This post is based on my reporting trip to Ethiopia with the International Reporting Project. SOS Children funds most of their work through a community of over 10,000 sponsors around the world. To learn more about SOS Children, click here. Wow, this is a really interesting model and it certainly sounds successful! I visited an orphanage in Russia which was absolutely heartbreaking. Nearly all of the children had readily apparent fetal alcohol syndrome and they were clearly starved for attention. It is great that in the SOS Children’s village each kid has a parent that will give them the attention they need so they have the opportunity to develop healthily! Thanks for sharing! Yes I’ve been to orphanages in other parts of the world and usually they are quite sad. The SOS Children model really is lovely and it is too bad there can’t be even more of them. The children grow up loved and in a family. With such a high success rate of self-reliance into adulthood it is a program and model that works. It breaks my heart that so many children in this world are left to grow up alone. I can’t imagine, especially being a mother myself. Beautiful insight into SOS & some great moments captured by your words (and photos). I worked at SOS Mbabane in Swaziland last summer, so can definitely relate, and am glad to see the great work SOS is doing elsewhere in Africa. Wow that sounds cool. What was it like working in Swaziland and what did you do at SOS? Sounds like a fabulous opportunity! Oh, my favorite picture is the one of the baby toes. 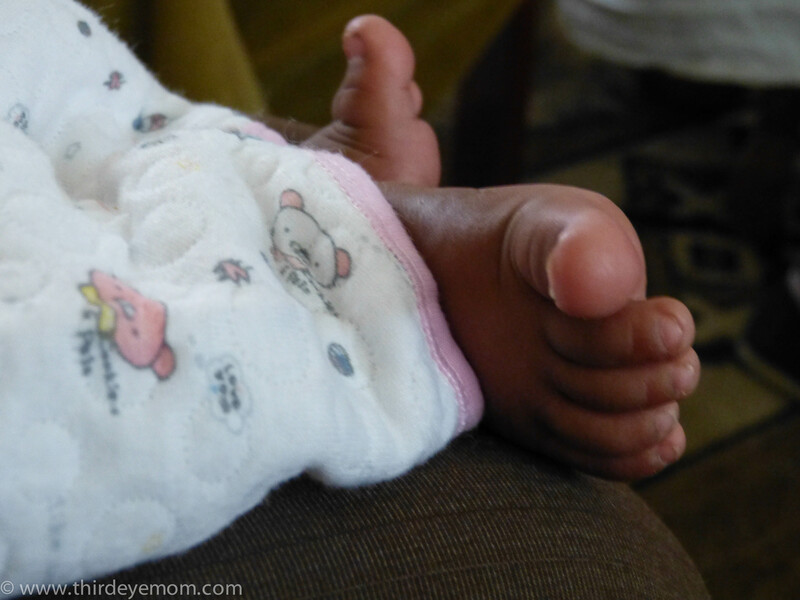 I love baby toes. It is wonderful to see that SOS has stringent requirements and months of training, plus they provide social workers and other support staff for the families. This looks like a fantastic program. I love that picture too! Yes I’m glad that SOS is in existence especially after visiting many orphanages around the world. Having a loving home with siblings and a mother who loves and cares for you is wonderful and is really helping these children who would else be much less fortunate somewhere else.